Those of you who have been reading BCDC for a while know that I am totally addicted to Goodwill, thrift stores and rummage sales. I’m actually quite excited because I’ll be helping at my sister Ele’s church rummage sale tomorrow!. Well several months ago at that same rummage sale I found a wonderful deal…you know I love a deal! 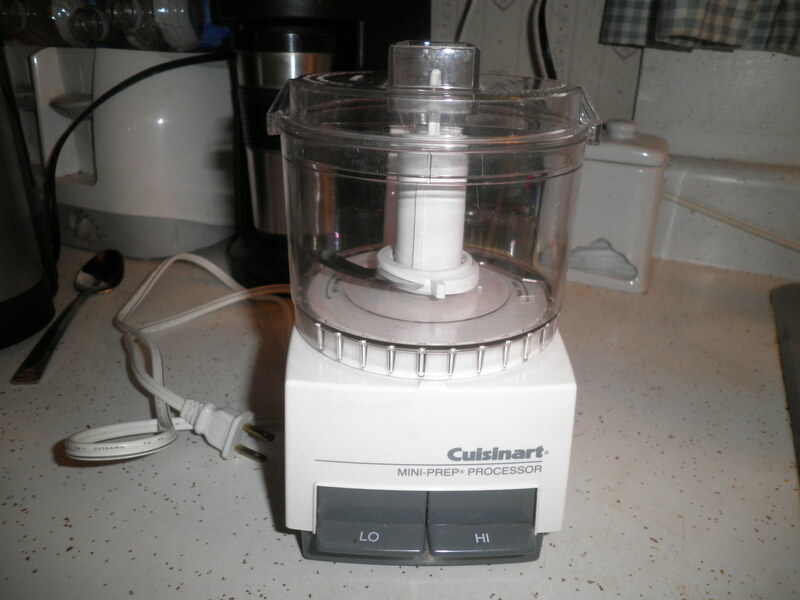 It’s a Cuisinart mini-prep processor. It looks bigger in this photo than it actually is but it was in perfect shape…and it cost $1.oo!!! I couldn’t believe it! I scooped it up immediately! 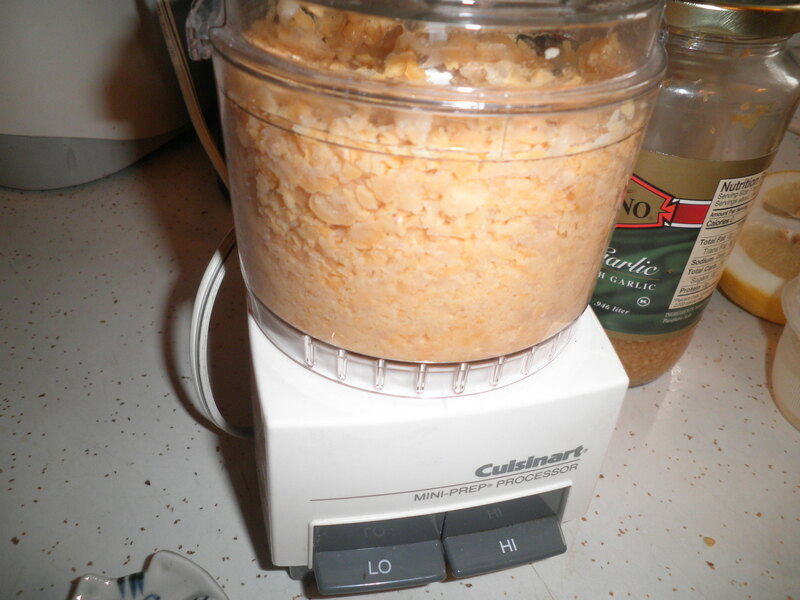 Well, I have long wanted garbanzo beans to meet mini-prep processor. Yesterday was the day! 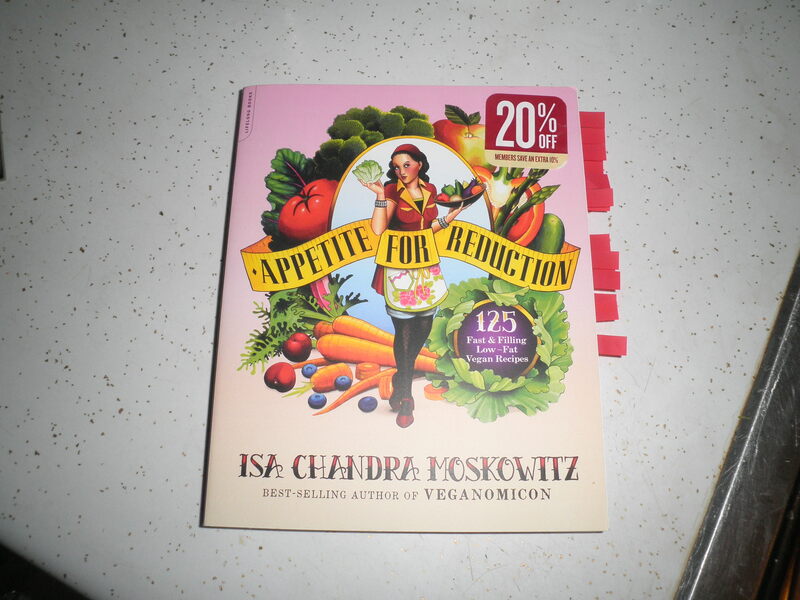 I used the recipe I found in Isa Chandra Moskowitz’ book Appetite For Reduction. It’s a cook book filled with what look like tasty recipes but this is the first time I’ve tried one. I picked this mainly because it was low-fat and I had all of the ingredients! The starting lineup. Not a lot of ingredients…My kind of recipe! Since it was my first try, I figured there would be lessons to learn. 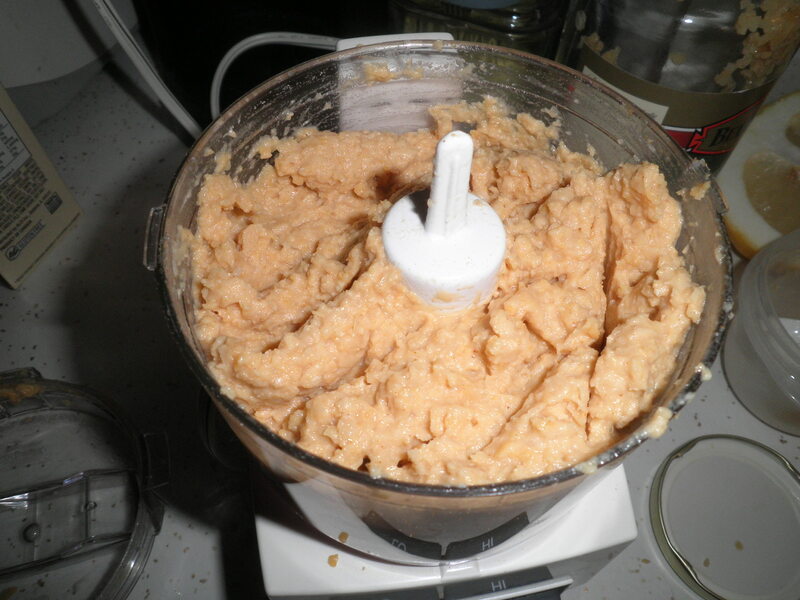 First, this would probably have been easier with a full size food processor. I have a brand new one in the basement, never out of the box. I am kitchen space challenged as you have all heard before. This worked just fine. Next time however and I’m excited to say, there will probably be a next time, I will process 1 cup of beans first, then the second. Putting all of them in at once made it too full and required a lot of taking the lid off and pushing down with a spoon. It’s beginning to look a lot like Hummus! Once it processed down a bit and I added the liquid it started to look really good. It smelled good too! Ta Da!! It looks like Hummus, it smells like Hummus, it TASTES like Hummus! I was so excited. Ralph was out while I was doing this and he was hysterical when he walked in the door and I pushed the container in his face, saying…”Look at my Hummus! !” He’s not a fan of hummus but agreed it definitely Looked like hummus. He said he was really proud of me. 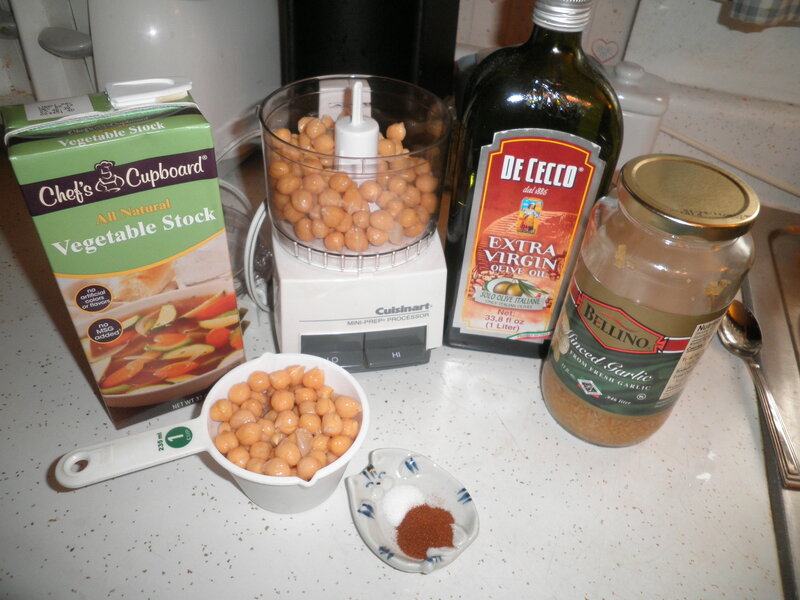 Open the chickpeas and pour off about 4 tbsp of the liquid. 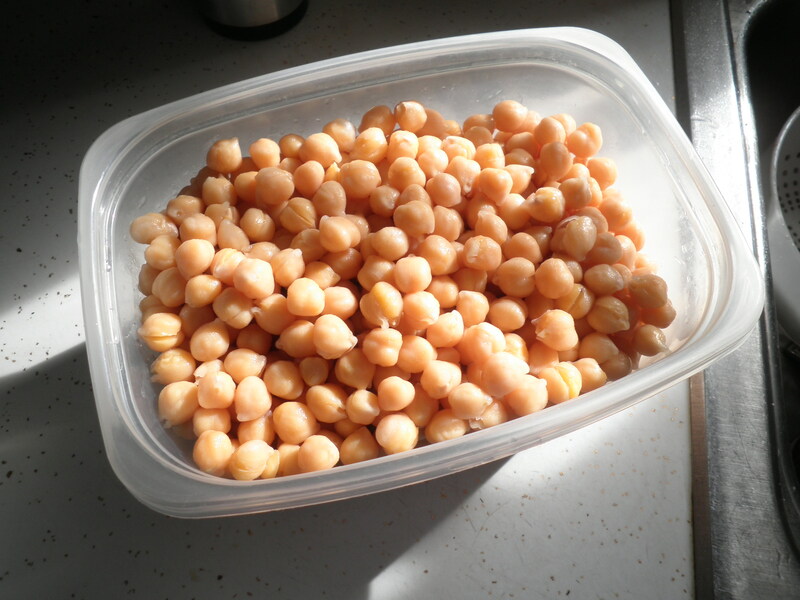 Drain the rest of the liquid and rinse the chickpeas. Pulse them in a food processor along with the garlic. Add the olive oil, lemon juice and pulse. Add 2 tbsp of the reserved liquid, salt, and paprika if using. Blend until very smooth and add in extra liquid a tbsp at a time if need be. Taste for salt & lemon juice. (I ended up adding more lemon juice). Let chill if not using immediately. Since I was using homemade beans, I just used 2 cups (16 ounces). Also there was no bean liquid from the can, so I substituted veggie broth. Honestly, this was so easy, I don’t know why I took so long. It’s delicious and it is lower in fat that the store-bought versions. Less expensive too! There are variations and I will try them next time. Actually, I have a few of my own ideas now that I know I can do it. 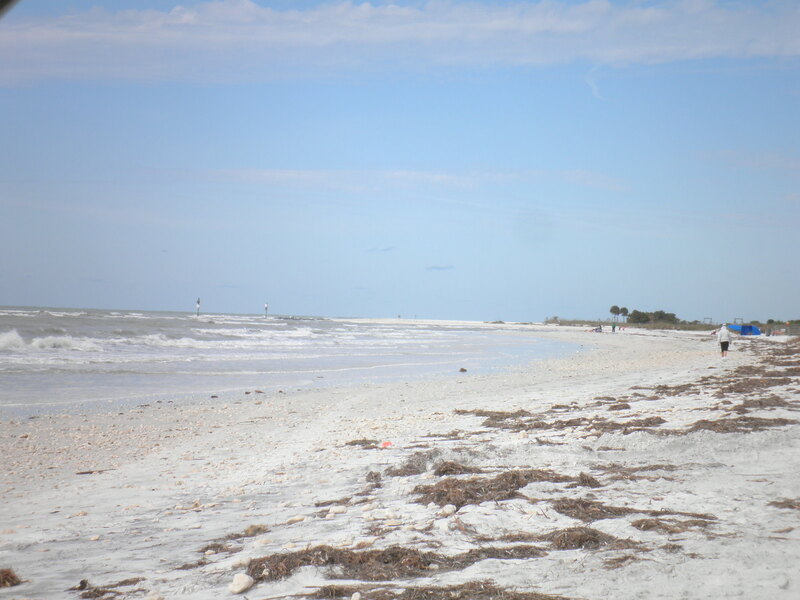 I’ll leave you with a pretty beach photo from Honeymoon Island. Happy Friday from The Bean Queen!! This entry was posted in Uncategorized and tagged beans, recipe, The Bean Queen, The Great Thrift Store Tour, The Thrifty Vegetarian. Bookmark the permalink. That looks amazing! I love home made hummus and have some big plans for making a load when I get back from my holidays! Laura! I couldn’t believe how easy it was. With this recipe, it reduced the Points for me on Weight Watchers. I was very excited! I would love to buy your full size processor if you have a mind to sell it. I am finding that my bullet and my immersion blender are great for some things but I need a bigger one for my larger projects. Yes, sometimes food is a project at my place. I make things to last all week or put in the freezer. If you are not wanting to sell yours, I would appreciate you keeping an eye out for a used one at the Rummage Sale. Maybe I can come this month. Sorry, Ginny. I’m not selling it, just don’t have room at the moment. I’ll unpack it when I get to NM! I will keep an eye out for you. I see them sometimes at thrift stores. Want me to look there too?! Nice job!!! 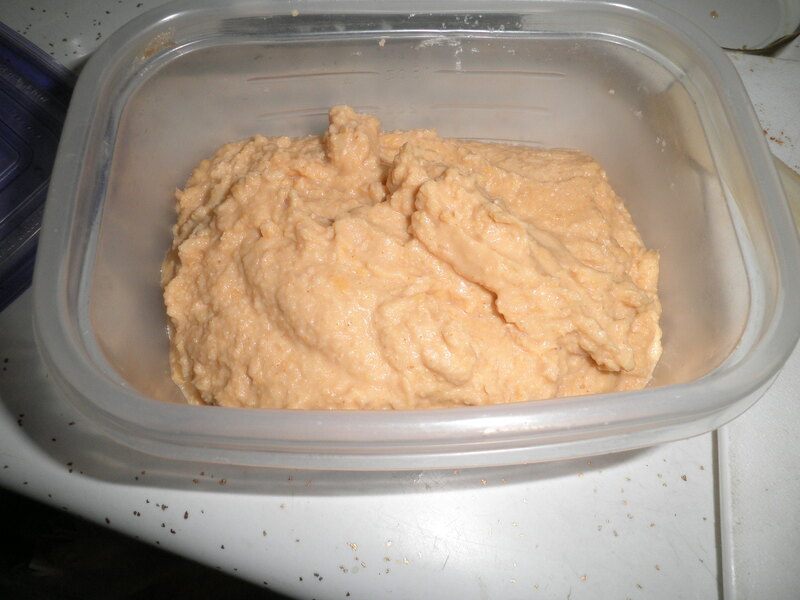 It took me a long time to get hummus right, which is funny but I really did have a LOT of bad batched of hummus! Thanks, Liz! I’m excited because I love it. This tastes good, it’s cheap and it’s low fat. Ok by me! Oh yummy, I bet it tastes so fresh. And a mini Cuisinart for a buck, even sweeter! Thanks, Marie! I’m always on the look out for a deal! You’re welcome! You’ll love it…so tasty ans SO easy! I miss you…Hugs! Mmm, hummus! I love it, make it all the time. So easy to play with flavors and ingredients. Black bean-based hummus (rather than chickpea) is really good too, especially with some hot sauce or mexican spices mixed in. Carrot-based hummus is also delish, and insanely healthy, which takes some of the fun out of it 🙂 But I think my fave will always be roasted red pepper hummus–that’s just a classic. Allie, I can’t wait to get creative with the hummus, but I wanted to do it regular the first time just to be sure I was doing it right. I’m open to suggestions! The black bean sounds yummy! Yum – I love hummus and it’s so easy to make (although I’m often lazy). That blender was a bargain! I wish I had the patience to look through all the stuff at thrift stores. Sarah, thrift stores are the best. You never know what you’ll find! I love in-process photos for recipes. Thanks Fran! This looks great! Thanks, Jen. Sometimes I think I get carried away with them so I try to restrain myself. 😉 Thanks for stopping by!